The International Electrotechnical Commission (IEC) has published standard IEC 60601-1 for medical electrical equipment that mandates general requirements for basic safety and essential performance. Our Aceso dual-modality system must comply with these standards in order to secure the CE Mark. Clause 15.3.2 describes the push test which requires an enclosure to be subjected to a steady force of 250 Newton (～25 kg) for a period of 5 seconds by means of a suitable tool and, after the test, any damage that results in an unacceptable risk constitutes a failure. Earlier this week we designed and built such a tool (seen above right) and calibrated it using a certified scale. Although the tool functioned as intended, it was a little finicky to use, which prompted CapeRay’s head engineer, Roland Baasch, to describe the tool as a “Heath Robinson” design. This begs the obvious question: What did he mean by the comment? 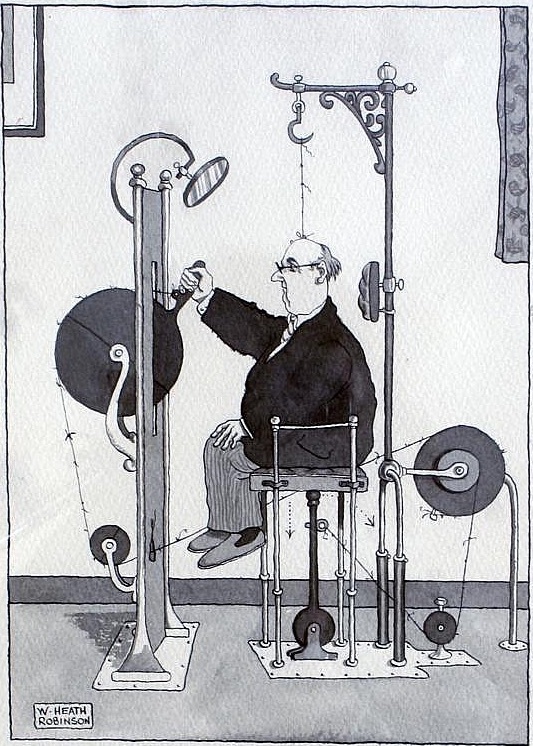 William Heath Robinson, who lived from 1872 to 1944, was an English illustrator and cartoonist, best remembered for his drawings of ridiculously complicated machines that were designed to achieve a simple objective. Born into a family of artists, he made a name for himself during Word War I in which he depicted cartoons of secret weapons supposedly being used by the combatants. In the 1930s Robinson published Absurdities, a collection of his favourite humorous drawings, some of which used complex pulley arrangements, including “The Wart Chair,” a simple apparatus for removing a wart from the top of a person’s head (seen above left). While the English have Heath Robinson, the Americans have Rube Goldberg, who lived from 1883 to 1970. Encouraged by his father, Goldberg enrolled at the University of California, Berkeley and graduated with a degree in engineering. However, his real passion was drawing and he pursued a career as a cartoonist, eventually being awarded the Pulitzer Prize in 1948 for his political cartoons. 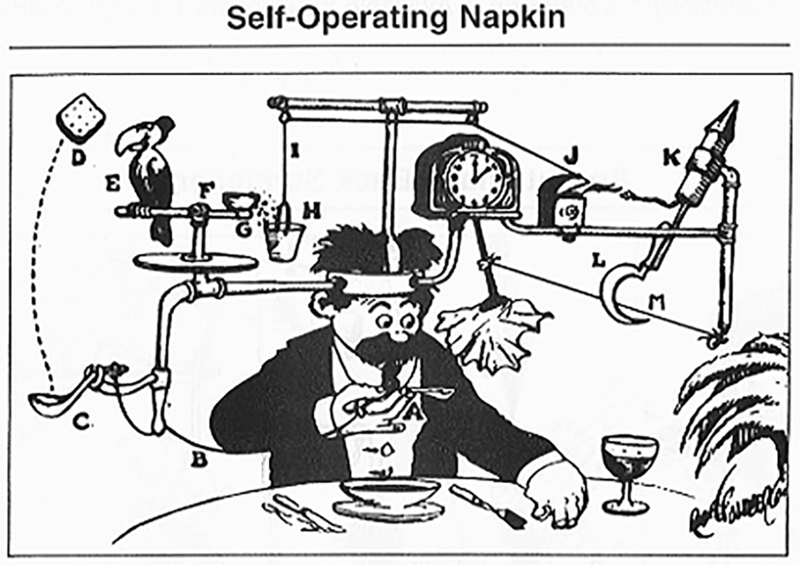 Goldberg is best known for his depictions of complicated gadgets – such as the self-operating napkin seen above right – that were designed to perform a simple task in a convoluted way using a domino effect, where one device triggered the next. 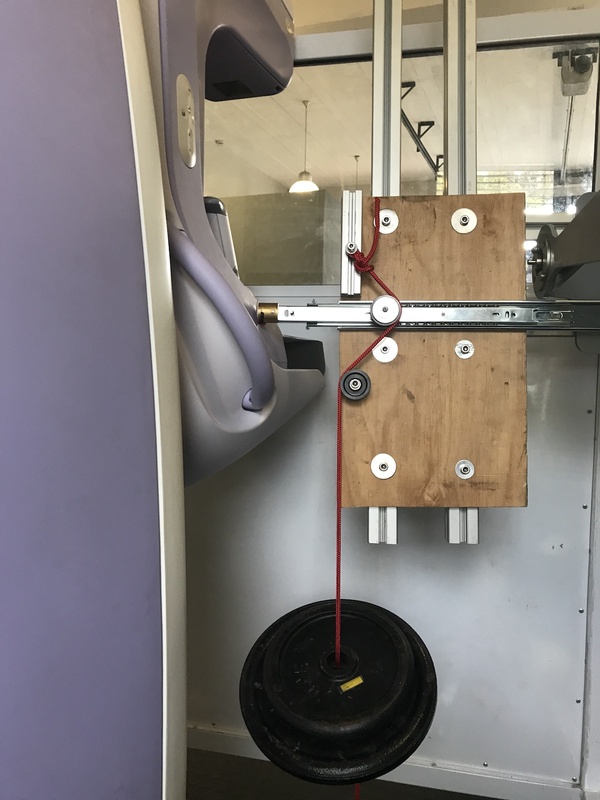 Yesterday we conducted the push test on the Aceso enclosures using our Heath Robinson tool, and we also performed the impact test using a 500 gram steel ball (clause 15.3.3 of IEC 60601-1). We are pleased to report that Aceso came through with flying colours, registering no residual damage, and bringing us one step closer to the CE Mark. let me say that you’re really great to conceive the right answer to psychedelic regulatory demands! In God`s name how much longer is it going to take? In the mean time a woman dies every 12 to 15 minutes from breast cancer? Are there any more hoops to jump through on the horizon? Your cartoons are most appropriate, with just a touch of ridicule. Thanks for your feedback, Antonio, Ian and Eb. Antonio: I am not sure if you watched the YouTube video by clicking on “the impact test” link above. Dropping a 500 gram steel ball onto our device was a scary experience. I guess you just have to keep a sense of humour! Ian and Eb: Fortunately these were the last of the tests so now we just wait for the reports. Hopefully it won’t take much longer and we can get on with the business of supplying Aceso systems to clinics in South Africa and around the world.